New Harbinger Publications, 9781626252905, 224pp. How can you prepare for and prevent your kids' inevitable meltdowns? 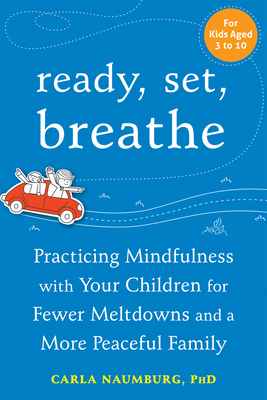 Ready, Set, Breathe will show you andyour child how to focus, calm down, and live in the present moment. Being a parent is stressful, and when your child has a meltdown, it can be difficult to keep cool--let alone help your child to calm down. Ready, Set, Breathe offers real solutions to help you both deal with stress using everyday mindfulness games, activities, rituals, and habits. Designed for children ages 2-10 years old, this book is fun, engaging, and effective. As any parent knows, children aren't always receptive to what you say. Parental advice is often ignored or perceived as intrusive; and trying to get your kid to calm down and breathe can turn into an unpleasant power struggle in which you feel powerless and frustrated; and your child can feel nagged or bullied. The good news is that it doesn't have to be this way. In this book, you'll learn to teach mindfulness to your child in the most enjoyable and realistic way possible. You'll also learn skills to help yourself stay calm when your child does act up--especially in public. Carla Naumburg, PhD, is a clinical social worker, writer, and mother. Her first book, Parenting in the Present Moment, was published by Parallax Press in 2014. Naumburg is the Mindful Parenting blogger for psychcentral.com, and a contributing editor at kveller.com. Her writing has appeared in The New York Times, The Washington Post, and The Huffington Post, as well as in a number of academic journals and online magazines. Naumburg holds an MSW and a PhD in social work, and she has an advanced certificate in mindfulness and psychotherapy. She currently lives outside of Boston, MA, with her husband and two young daughters. Connect with Carla and read all of her writing at www.carlanaumburg.com.